Eclipse is Sunday nights from late April through Labor Day weekend. The sun has gone down but the party doesn’t stop at Eclipse Las Vegas. 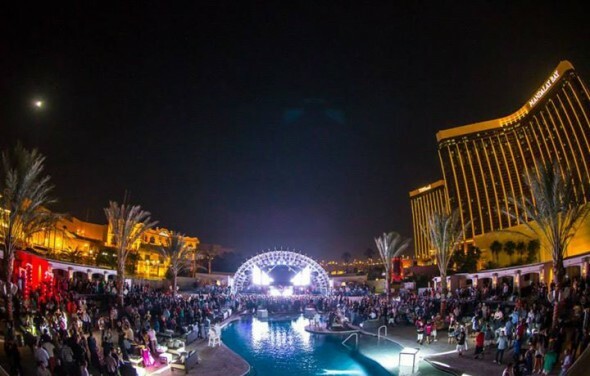 Mandalay Bay’s nighttime pool party offers party goers the opportunity to enjoy Las Vegas summer nights as well as the excitement of a full-fledged club experience. Complete with an impressive DJ lineup, a large pool area and plenty of room to dance, Eclipse is one of the Las Vegas pool parties not to be missed! Take in the Sin City energy and some of the best EDM entertainment around at Eclipse. There’s no better way to keep the party going in Vegas once the sun goes down then with this unique nighttime party. Sign up on our Guest List to get your groups’ ladies in for free with 2 drinks, and gents in for reduced cover of $20. Every Sunday through the summer months, Daylight Beach Club comes to life after dark. This exclusive night time concert series features the best electronic artists under the stars from 10pm-3am in Summer. See Also: Las Vegas Nightswim for more information.